As a little girl I wrote children’s stories. They started out on notebook paper, folded and illustrated, later evolving into handmade, hardback picture books, and then finally chapter books typed on a cheap typewriter, which I’ve kept through the years. I have over forty of these precious books, but they are yellowing with age. Later, I tried my hand at historical romances (a Victorian and a regency), but was too scared to make a serious effort at getting them published. After 9/11, I wanted to go in a new direction–back to my roots of writing children’s stories. I especially wanted something my young children and future grandchildren could read. Craft-wise, how did you approach your apprenticeship as a writer? I’m not the first to say this, but I think you learn the most about writing from reading. I’ve always been an avid reader and continue to be so. It’s one of life’s greatest pleasures for me, except for maybe chocolate (Dove and Godiva, if you please). I just finished Bird by Bird by Anne Lamont, and she has some very wise things to say about the craft of writing. She stresses the importance of getting that first draft down, no matter how terrible it is, and then going from there. 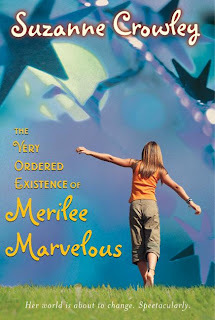 Congratulations on the success of The Very Ordered Existence of Merilee Marvelous (HarperCollins, 2007)! Could you tell us a little about it? It’s about an autistic girl, Merilee Monroe, age 13, who lives a very ordered life in her small dusty west Texas town of Jumbo (Marfa) until three strangers come to town and she learns to let friendship in. There’s a little bit of southern magical realism, lots of folktales, dragon myths, urban legends, and funny Texas sayings stuffed in, too. And a cast of quirky, but lovable (except for maybe Grandma Birdy, who is cat-scratch mean) characters. Ultimately, I think it is about finding magic, or hope in one’s life, the power of imagination, and the love of one’s family, no matter what form they come in. Two major things. My oldest daughter, thirteen at the time I wrote the first draft, inspired Merilee, the main character. She is somewhere high on the autism spectrum (probably Asperger’s [Syndrome]) and has always been an unusually gifted and unique child, almost like a savant in many ways. She went through many obsessions but was in love with dragons at the time I started thinking about writing a children’s novel. She drew dragons on everything–her homework, tests, any piece of paper she came into contact with. Dragons were very popular at the time (and still are), and I thought, at that very moment, this is it! A story about an autistic girl living in an imaginary world of dragons. “Dragonlands” was the working title for a long time, but it was nixed eventually because it had the connotation of a fantasy and it is not. So now I had a premise but where was I going to set it? About this time I went to a girl’s-only retreat in Marfa that a sister-in-law hosted. One very dark night on the way home from a dinner in Alpine, she took us to see the famous “Marfa Lights off the highway at a state viewing point. They were visible that night–hovering faraway on the west Texas horizon. Simply magical, and I knew then that west Texas was the perfect setting for my book and the “lights” would make an appearance somewhere. I started writing VOE (our nickname at Greenwillow) around February of 2003. I wrote a first draft, almost stream of consciousness style, in three months. It was really a solid outline, I realized much later. We were about to move to Florida from California, and my husband had already transferred. I stayed up late at night and worked and also wrote when my then eighteen-month-old son napped. After we joined my husband in Florida, I put the draft away in a drawer. But when my then fourteen-year old started writing her own fantasy novel, which ended up being 550 pages, I decided to pull my draft out, dust it off, and figure out the children’s publishing world for her sake. I joined SCBWI, sent out 25 queries to publishers listed in the booklet I was given, and eventually had interest from seven publishers. I noticed in one of the SCBWI newsletters that one of my high school friends was writing picture books–Dianna Hutts Aston (author interview). I contacted her and we started emailing back and forth about what was going on in our writing lives. When I started to get my any manuscript requests, she suggested I query Greenwillow–she knew one of the editors there. They asked for the manuscript, too, and it was actually Greenwillow who I first heard back from–a short two-line memo that left me breathless and giddy for days. Based on this email, Dianna felt it was time I had an agent so she told Rosemary Stimola (agent interview) about me, and Rosemary, after reading the manuscript, quickly signed me up. I had several publishers actually interested in VOE, but they all wanted revisions (in different directions). Something felt right about Greenwillow, so we went with them, thank goodness. For a year and a half, in which time I went though yet another move and my editor went on maternity leave, I did revisions. Eventually, I was asigned a new editor, Virginia Duncan, who loved my manuscript. Coincidentally, she knew about Marfa because one of the author-poets that Greenwillow publishes, Naomi Shihab Nye, had recently been a poet-in-residence in Marfa and would send Virginia emails describing the beautiful landscape and the Marfa Lights. I also have a poet-in-residence in my book, but he gets into a lot of trouble! Everything just clicked. We worked on new revisions (yes, more), and my book was published August 21 2007. One of the difficulties was getting the autistic voice of an Asperger’s child correct. Sometimes they talk like little professors; other times they speak hardly at all. Trying to get a truthful, natural cadence was something I struggled with for a long time. In early drafts, Merilee was speaking in full paragraphs. I had to go back and dramatically cut her dialog. But her inner thoughts are still there–I really wanted to convey to the reader that these kids have a rich inner theater and they have stories to tell, if someone will listen. This was the real test and I passed it. I truly want to honor these different kids. I know now the revisions process made the book 100 times stronger, but along the way I struggled with self-doubt about my writing abilities. And I procrastinated too. Sometimes a week or two would go by, and I could barely look at my work in progress. But it was all worth it. Anytime someone tells me about a favorite moment in the book, it has been birthed from a revision. And I’ve had several librarians tell me they love the first line of the book, and that is something that got added late in the process. So I’m actually looking forward to the revisions for book two! Hold on, hold on, it will happen. And if it doesn’t, that’s okay. It’s what you learn on the journey that is the most important. I’m still struggling with that. When my first book debuted, I started my second book and was under deadline. I think it helps to do school visits and book-signings in clusters and spurts and spend most of your time writing. But I still worry about the promoting every day–am I doing enough? At some point, you just have to let it go. I’m waiting any day now for revision notes from my editor for book two, which is a YA historical set in Elizabethan England. It’s rich with detail of the era, especially the embroidery and making of Queen Elizabeth’s dresses. There is a bit a mystery, too, but it is a love story at heart. I guess I’ve come full circle.